“I should not hear the opening of the gate. The Confidential Clerk, a wordy and dense play by T.S. 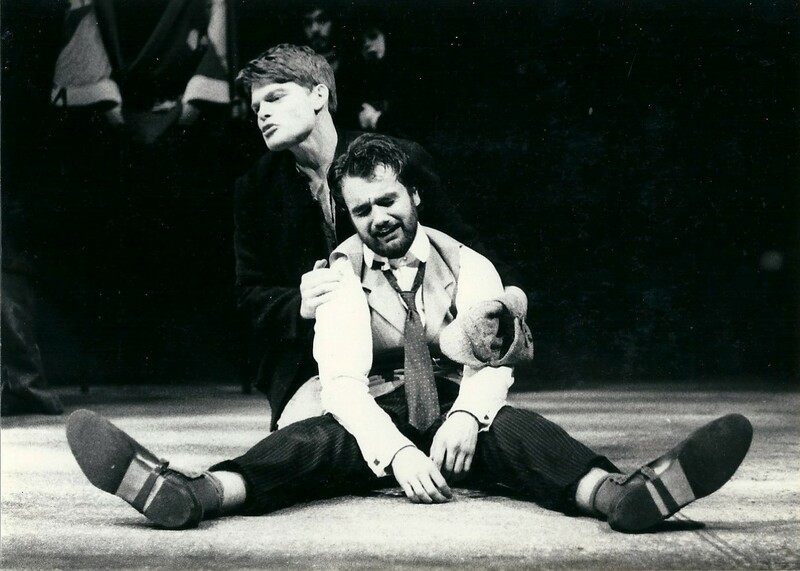 Eliot with some nonetheless beautiful sections was one of my final productions at LAMDA in 1977. Nearly 40 years went by. It took some courage to decide to go to a college reunion three weeks ago – To those who braved it, I salute you. A number of people were no longer acting and were hard to trace; some sadly were no longer with us at all. Some could not come as they were away working or living abroad. Some decided it was not for them. I actually had a fantasy as I travelled to Earls Court on the Tube that it was all a joke and when I arrived at the restaurant I would be the only person there. Our whole adult lives had gone by since our first days at the London Academy of Dramatic Art and now twelve of us were to meet together in a restaurant on the Earls Court Road. There were people from our own year and the year above us. For me it was an extraordinary experience. I had had my 60th birthday party some weeks before, and had allowed myself a full party with memories and even made a little gallery of my acting work over one wall of the living room. I never ever do this kind of thing but for some reason having made this landmark event of my 60th year, the reunion and the chance to spend time with some of the people with whom I had spent such an intense period decades ago seemed to be very timely. When you discuss with someone how you read the whole of Shakespeare aloud with them in their living room ( well not all of it, we definitely missed out THE MERRY WIVES OF WINDSOR) in the holidays; or when you talk about a play you did with them; or how you did not think you could survive the rigours of the school in the first week, you remember just what a powerful time it was. The influence of these people upon your life is enormous even though you maybe have forgotten them . They are seeped inside you. Two people said to me that they felt that all the years had gone by and yet I was essentially still me. I found this rather delightful, yet something perturbed me about it . I did not feel myself to be the person they described. I felt myself tense, childlike and very vulnerable then . I did not feel like the curious and expansive person they said i was – I said that was me now rather than when I was a young man. This brought up a lot of philosophical thoughts afterward about how much we get in our own way when we are young. The current careers of this group was varied; some of them were actors; some were teachers; directors; leaders in presentation skills; some worked in community; some had focussed primarily on family. What struck me was something I already knew – that a drama school training has so many transferable skills not just for a variety of careers, but also to simply expand a sense of ourselves in life. The exploration of being, the personality, the way you have to seriously challenge your way of doing and responding to things physical,intellectual and emotional make it an amazing education, one which I would not have missed for anything. It gave me the tools to be a fuller human being, not theoretically but through artistic discipline and practise. I feel profoundly grateful, even though some of the experience was extremely challenging. As I left the restaurant a few weeks ago after the reunion I saw the Lloyds Bank where I used to get my grant cheque – yes my grant cheque. Without government support going to LAMDA would have remained a dream. The one area with which I had serious issues through the training in retrospect was the fostering of ruthless competitiveness. It is not hard to make young people competitive, and of course developing this is meant to sort out the ‘wheat from the chaff’ . Ironically though, being competitive and working hard and being talented does not necessarily mean success, though sadly the ‘talent will out’ myth continues to proliferate. We kept away from this difficult topic at our reunion, perhaps because at that moment, the atmosphere of competitiveness gloriously, did not matter at all. This entry was posted in Uncategorized and tagged Acting, LAMDA, Reunion, Theatre Education on June 14, 2015 by maxhafler.